A Nordic structure has claimed the title of world’s tallest timber building. Mjøstårnet by Voll Arkitekter is a 280-foot-tall tower in Brumunddal, Norway, constructed entirely out of cross-laminated timber. It’s the third tallest building in the country and features 18 stories of office space, apartments, a hotel, a ground-floor restaurant, and an adjoining public bath. Designed like a monumental wooden box planted atop Brumunddal’s open, lakeside landscape, Mjøstårnet stands as a symbol of the “green shift.” It’s all wood—even it’s elevators are built from CLT and its large-scale interior trusses, as well as the structural columns, are glulam. 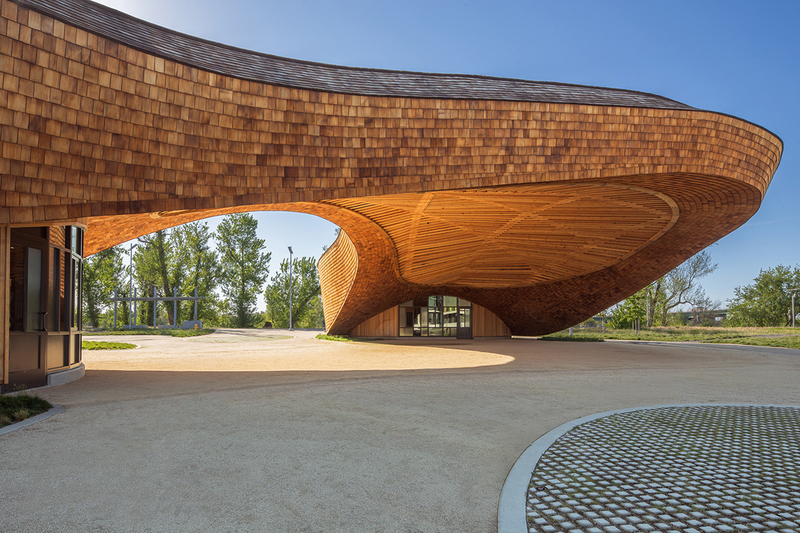 The architects used local-sourced materials crafted from local suppliers to build the soaring structure, which features a series of wooden fins on its western facade and an open-air rooftop with a sculptural timber topper. Scandinavian company Moelven Limtre, owner of 17 sawmills in Norway and Sweden, supplied the wood and served as the Mjøstårnet’s structural engineer. ﻿ The mixed-use project is owned by AB Invest, a Jordanian investment group, and beats out Brock Commons at the University of British Columbia by 90 feet. Though the Vancouver-based student housing project also stretches 18 stories high and is actually larger than Mjøstårnet in overall square feet, the Nordic building bests it in height. Last week, 3XN released renderings for what will soon become North America’s tallest mass timber office building, T3 Bayside. Imagined for Toronto’s burgeoning waterfront community, it’s slated to rise just 138 feet. Toronto’s interconnected “smart neighborhood” is inching ever closer to reality. Sidewalk Labs has released a batch of new renderings from Snøhetta and Heatherwick Studio, as well as documents detailing how the company plans to pay for the ground-up development. 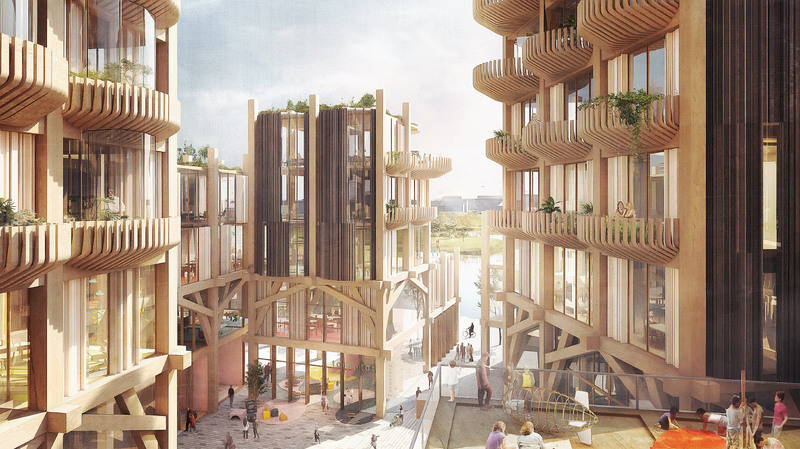 Sidewalk Labs’ Quayside waterfront Toronto neighborhood is being touted as a smart, interconnected, “100 percent timber” development. In a February 14 Medium post, the company released a progress report detailing its progress before the finalization of its draft Master Innovation and Development Plan. One proposal that’s drawing flak is an arrangement where Sidewalk Labs would build infrastructure such as light rail on the site in exchange for a share of the revenue generated by increased property values—diverting tax revenue from public coffers. Sidewalk Labs claims the arrangement would allow the neighborhood to rise “years, if not decades, sooner than it would otherwise. This would unlock the potential of the Eastern Waterfront, and the jobs, housing, and economic growth that will come with it.” The company also clarified how many units of housing it would be building in the neighborhood, which would contain 12 mass timber towers. The project will adhere to the site’s existing zoning and will be 90 percent residential. That means 2,500 units total, 1,000 of which would be rented at below-market rates, and 50 percent of which would be “purpose-built rental apartments.” Half of the below-market housing would be affordable (and a quarter of that marked as “deeply affordable”) and the other half would be designated for middle-income earners. 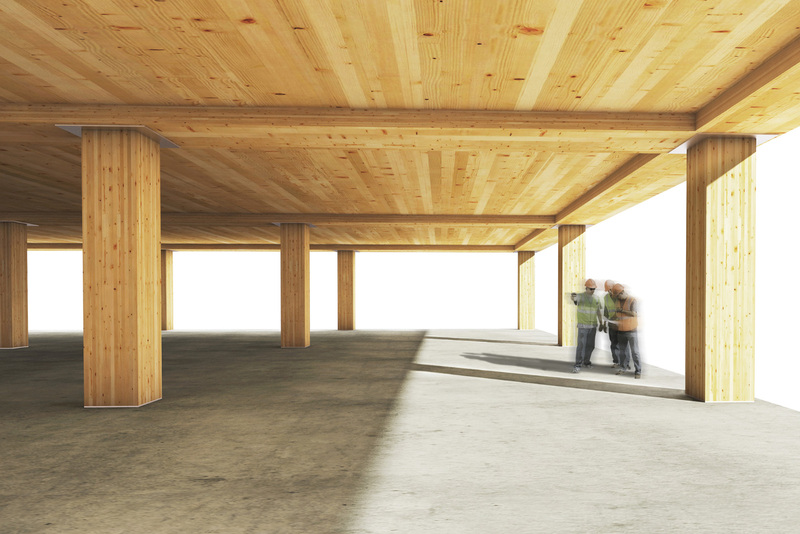 To meet the high demand for timber that the 12-acre project requires, Sidewalk Labs has announced that they would build a tall-timber factory in Ontario, which would supply up to 4,000 new jobs. Google’s 600,000-to-one-million-square-foot Canadian headquarters could also be in the making on the western side of Villiers Island along the planned light rail loop. Retail, an educational component, and amenities are likely headed to the campus as well. The neighborhood will also become a testbed for innovative urban technologies. Other than the weather-responsive “skirts” deployed at the open-air bases of each building, the entire project will be networked with high-speed Wi-Fi. A civic data trust would be responsible for removing identifying markers from any information gathered and aggregating it. On the design side, Michael Green Architecture has developed a mass timber kit-of-parts, and Snøhetta and Heatherwick Studio have designed building concepts for the campus, innovation zone, common areas, and other spaces. Of note are the “scalloped” balconies found throughout the residential developments and post-and-beam styled open-air “stoas” at the base of each tower. The design will continue to change as Sidewalk Labs solicits feedback from stakeholders, the Canadian and provincial government, and Alphabet, Sidewalk Labs' parent company. The entire presentation can be viewed here. 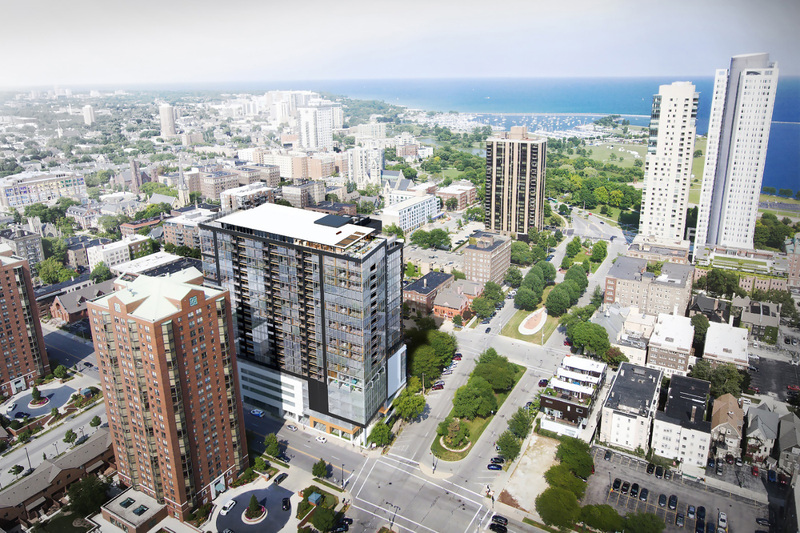 Mass timber is gaining steam and is set for another major boost, as recently passed code updates will allow structural timber up to 18 stories high. To keep up with the industry and its quickly changing landscape, we have mapped out the major players and the big issues surrounding wood innovation, from completed projects to boundary-pushing proposals that could shape the future of wood construction. 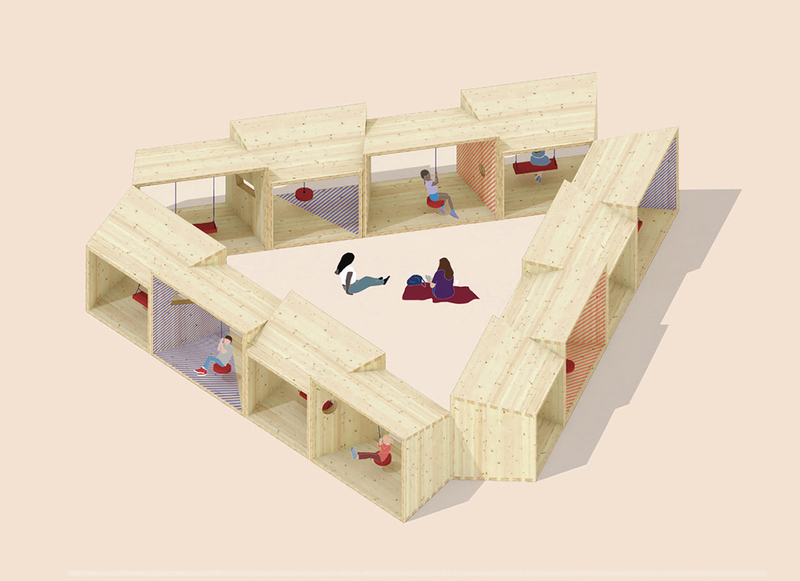 As mass timber becomes more viable, it is being envisioned for a wider range of project types and structures. Here are four designs from around the world that signal what wood's future could look like. Can Sidewalk Labs realize a totally timber smart city? Sidewalk Labs is planning a timber smart city to showcase state-of-the-art technology with help from Michael Green Architecture, Beyer Blinder Belle, and more. CRÈME proposes floating timber bridge to connect Brooklyn and Queens Brooklyn-based CRÈME/Jun Aizaki Architecture & Design's LongPoint Bridge could connect Brooklyn and Queens, offering a new path for commuters. Kengo Kuma is crafting a timber temple to sports for the 2020 Olympics Kengo Kuma's National Stadium for the Tokyo 2020 Summer Olympics is marching to completion and wading through some controversy over its timber. This 18-story building went up in 66 days thanks to the right mass timber products The Brock Commons Tallwood House designed by Acton Ostry Architects was erected in only 66 days thanks to products provided by Structurlam. Can Sidewalk Labs realize a totally timber smart city? Can one of the world’s oldest building materials form the foundation of a sensor-integrated “smart” neighborhood? Alphabet subsidiary Sidewalk Labs is making a go of it on the Toronto waterfront, and has enlisted wood advocates and Katerra partner Michael Green Architecture (MGA) to design flexible, mixed-use timber buildings for its 3-million-square-foot Quayside project. If the 12-acre site is developed as planned, it would become the largest timber project in the world. 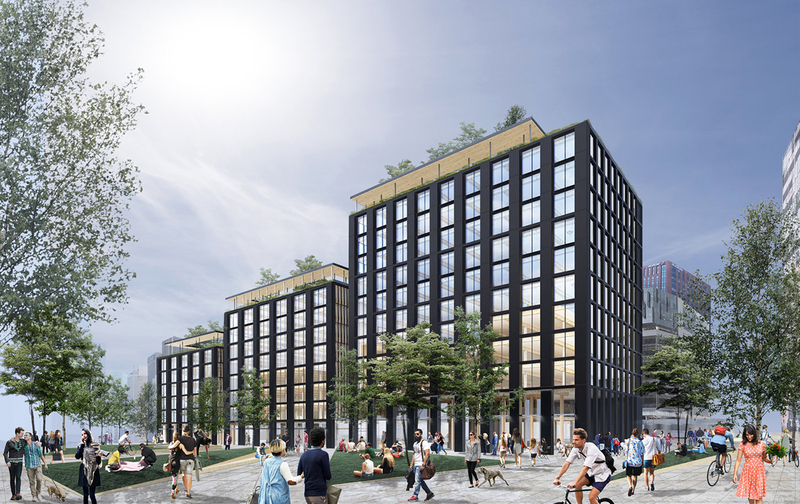 The ground-up development in Quayside is leaning on mass timber because Sidewalk Labs has touted the material as sustainable and as tough as steel, as well as because cross-laminated timber (CLT) panels work well in prefabricated structures. MGA has designed a kit-of-parts that can be used for buildings of every scale, and Sidewalk Labs is reportedly looking at constructing a collection of 12 mass timber towers, with the tallest topping out at 30 stories. Sidewalk Labs is aiming to build within Quayside’s existing zoning, which would entail 90 percent residential development. The neighborhood will encourage street-level interaction through a combination of design and environmental control. 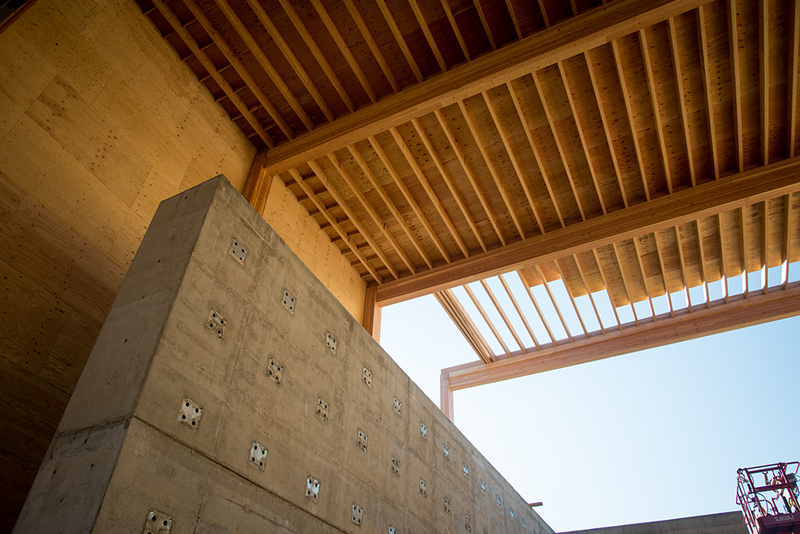 MGA has anchored the base of each building with a “stoa,” or an open-air covered walkway supported by a colonnade (in this case, V-shaped heavy timber columns) that will contain retail and communal gathering places. Of course, Toronto’s winters are especially punishing, and doubly so on the waterfront. 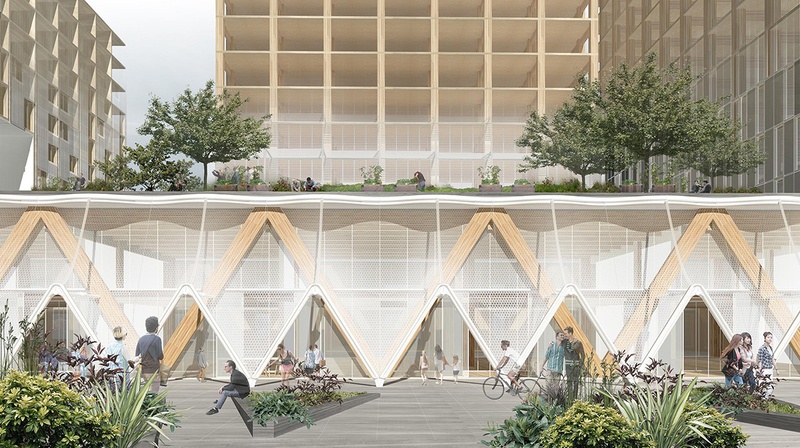 Sidewalk Labs tapped the architecture studio PARTISANS to design an “outdoor comfort toolkit,” including a computer-controlled retractable canopy that will clad the stoas. The umbrella-like structures will block out wind, rain, and snow while heated pavers will keep snow off of the streets; the company claims that both advancements will double the amount of time residents will be able to spend outdoors. Beyer Blinder Belle is responsible for the site’s master plan and Toronto-based PUBLIC WORK will be designing the landscape. Sidewalk Labs also reached out to the Ontario-based gh3*, Toronto’s Teeple Architects, and Toronto-based Dubbeldam Architecture + Design to create residential unit concepts. Sidewalk Labs will submit its final Master Innovation and Development Plan for public comment sometime this spring. 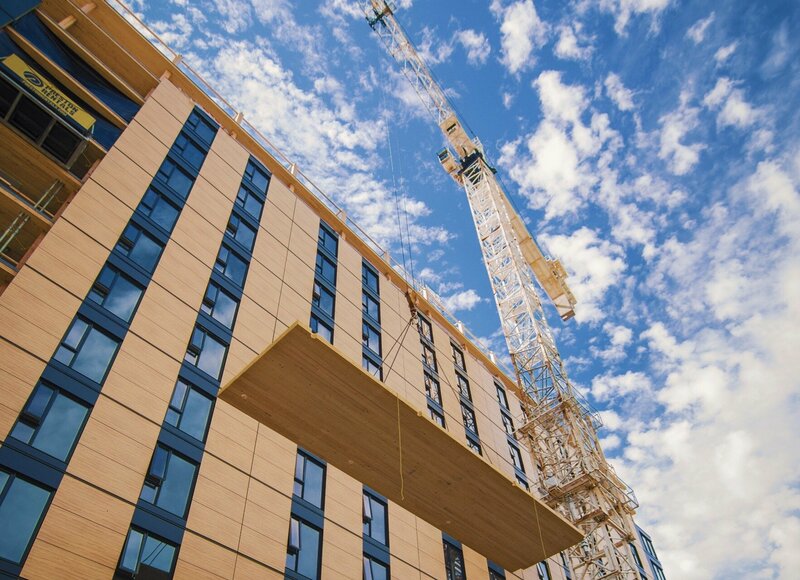 When it came time for Acton Ostry Architects to select a manufacturer for the mass timber components of the 18-story Brock Commons Tallwood House at the University of British Columbia in Vancouver, Canada, Structurlam stood out. As a result of Structurlam’s comprehensive approach, the hybrid concrete-and-mass-timber structure building was erected in record time: just 66 days. 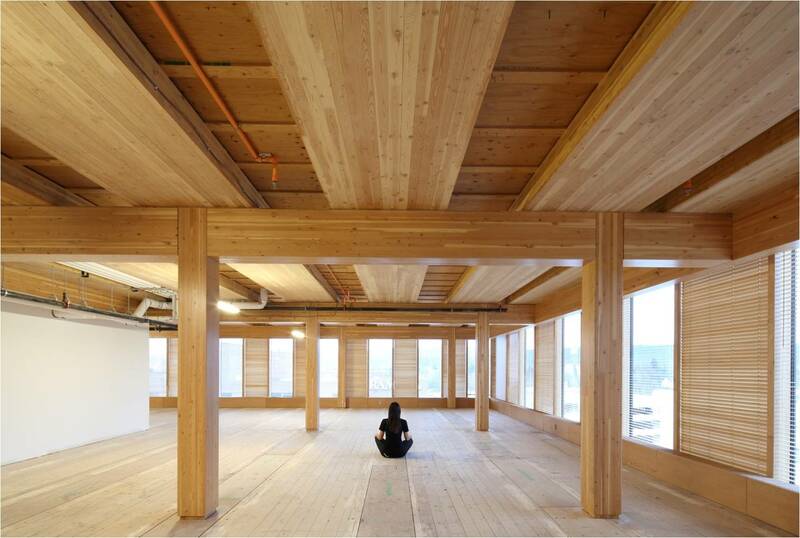 The tower features 1,302 10-inch-by-10-inch Douglas Fir Glulam columns and 464 Douglas fir CLT panels of varying thicknesses, all fabricated by Structurlam. But don’t think that all that wood is going to be hidden behind the project’s fire-resistant Type X gypsum wallboards. Instead, wood finishes cover the building inside and out. 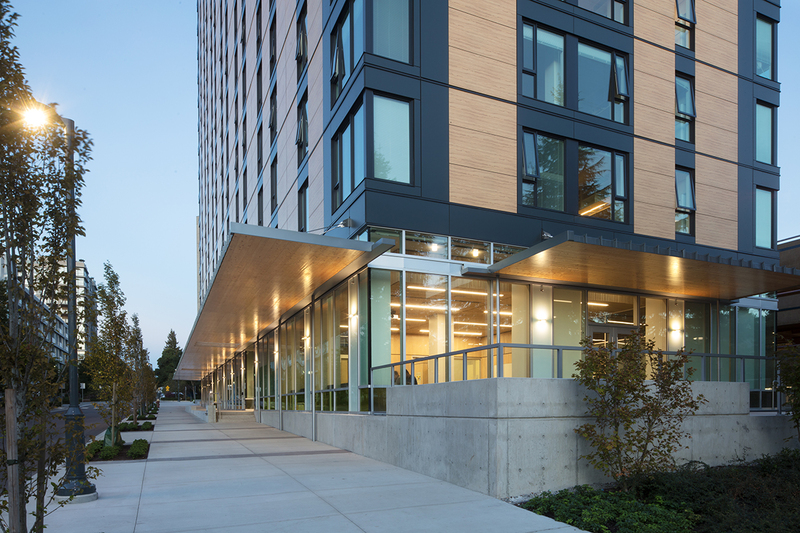 That includes the dormitory’s shared spaces, where JSV Architectural Veneering & Millwork has crafted maple veneer panels and wood grilles for the project. In other areas, 24-inch-by-24-inch albus wood ceiling panels by Linea Ceiling provide a “decorative and functional” alternative to conventional acoustic drop-down ceilings.